Displaying complex or detailed information in a digestable way is always an interesting challenge. It’s certainly s certainly one of the challenges that I’ve had with Anytown, my project to better understand interdependencies and complexities within and between systems. Nodes of different ‘city networks’ are shown in thematic colours (Gas, Electricity, Fuel, Water, Telecommunications and Wastewater). Please note that this is an illustration not a schematic of each network. 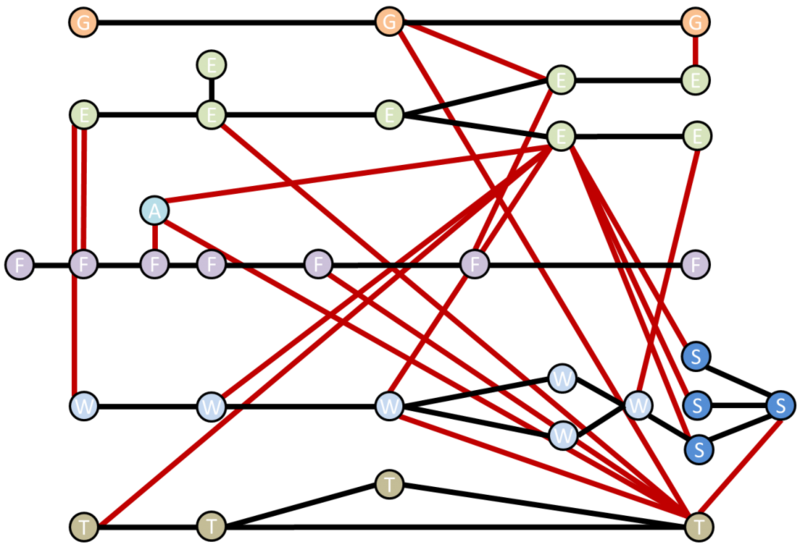 The connections within networks are shown with black lines, and where there is an interdependency with another network it’s shown in red. I’m now working on a way of using this alongside the previously developed ripple diagrams to better articulate interdependencies, ideally in an interactive way. If you have any thoughts on how this could best be achieved, drop a comment in the box below, or get in touch directly via Contact Us.